1. Pour 1 tbsp boiling water over the saffron and set aside. Heat the oil in a large non-stick pan then fry the onions and garlic gently for 8-10 minutes until soft and golden. 2. Meanwhile, remove the sides from the beans with a peeler and cut the beans into bitesize pieces. Stir the quinoa, paprika and thyme into the onions, cook for 1 minute, then stir in the stock, tomatoes and saffron water. Season and bring to the boil. Simmer for 10 minutes, until slightly thickened. 3. Add the beans, cover the pan and cook 10 minutes more until the quinoa and beans are almost tender. Spread the prawns over the top and give it a further 5 minutes or until the prawns are pink and thoroughly cooked. 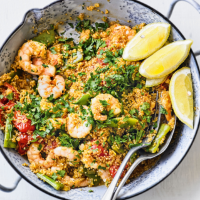 Season, fork the parsley and prawns through the grains, then serve with lemon wedges to squeeze over. This recipe was first published in Thu Jun 29 10:11:00 BST 2017.